Friday afternoon Joyce showed me the wool sweater she was wearing – a couple of moth holes in the front. She wondered whether they could be repaired. I assured her they could (there were two smaller holes near the first one as well) with a well placed machine embroidery. I spent some time locating an embroidery design that would sit over the holes, not be too dense, and I could set up to curve toward the shoulder. 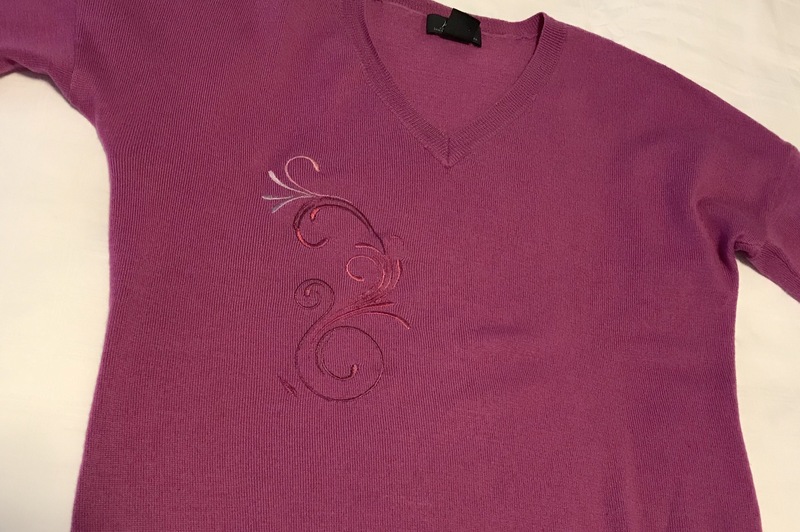 I turned the sweater inside out, used “Whisper Web” interfacing (a light, cut away), hooped the right front side, chose mauve/rose rayon embroidery thread, then stitched out the design. I added two small sections of close zigzag to obscure the larger hole further, and stitched out a single leaf over a second small hole nearby. The completed embroidery is subtle but it does the job. PS: I just returned the sweater to Joyce, she tried it on, and she’s thrilled with it! I’m happy she’s happy.